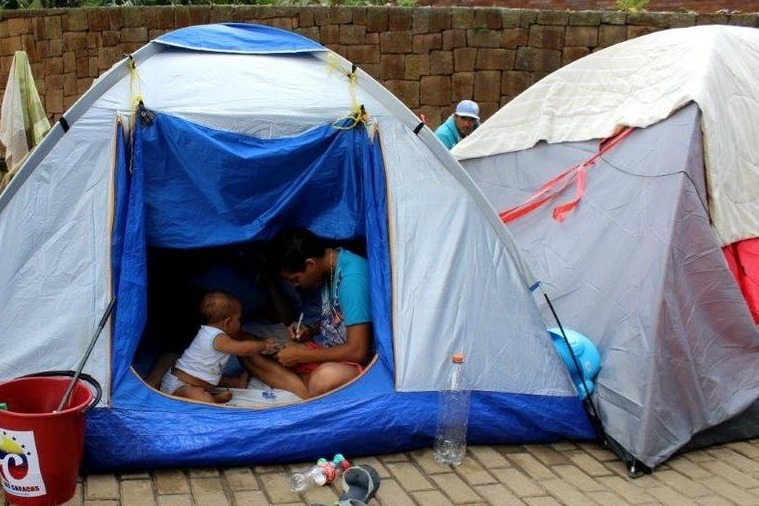 The city of Bucaramanga is experiencing a large influx of Venezuelan immigrants. Venezuela, once the richest country in the region, has declined so much that two thirds of its population currently live in extreme poverty. People have lost their savings in unprecedented inflation (estimated to reach 1,000,000% by the end of the year). The cost of food doubles every month. Despite parents giving up their own meals to give to their children, every sixth child suffers from malnutrition. Doctors do not have even the most basic medications for their patients. Preventable conditions are taking their toll. The desperation feeds crime, which has skyrocketed and is the third highest in the world. It is of no surprise that people are fleeing their country. Given the length of the border with Colombia, most of the refugees choose Colombia to be their new home, and the Colombian immigration office publishes the figure of 50,000 arrivals every day. For some of them (approximately 100,000 a month) it is the beginning of a 16-hour-a-day walk lasting 20 days until they reach Ecuador; others enter the country to secure medicines and food to take back home to their families. At the beginning of the year there were about 600,000 people from Venezuela in Colombia and the number is expected to rise to 1 million by the end of 2018. Whilst the Colombian government is responsive to the situation - putting in special administrative measures to allow for slightly easier legalisation of migrants - about two thirds of Venezuelans in Colombia do not have regularised migratory status, leaving them without the right to work, without medical care, without access to education, and highly vulnerable to exploitation. Colombia is a country still recovering from its own difficult past, having to integrate more than 7 million people that were internally displaced as a result of the decades long conflict. The extent of the need of Venezuelans in Colombia is simply too overwhelming given the limited resources available in the country. The congregation of the Methodist Church in the Bucaramanga area (a region that receives in excess of 400 new Venezuelan arrivals each day) is in the process of setting up an outreach programme to Venezuelan children - not in an attempt to replace state education (currently unavailable to them) but to give them a sense of normality, to allow them to form friendships, and to help them adjust to their new home country. Throughout the activities we will educate them about their rights as human beings and the fact that they form a part of God’s creation, and equip them with knowledge and skills to safeguard themselves from exploitation and abuse. We will also be providing information to parents as to where and how to access state-run services as well as parallel services (food, shelter, medical care) provided by other NGOs and churches in Bucaramanga, and we will distribute information about the necessary steps needed to regularise their migratory stay which would allow them to access many services as well as the job market. Finally, families in which there are pregnant women or babies will benefit from direct aid distribution and receive packets containing food and/or baby supplies. The project is being run by Iglesia Colombiana Metodista (ICM), the Colombian Methodist Church. I'm Chris Lacey , and along with my wife I've been sent by the British Methodist Church to work with ICM in their Center for Projects. We live here in Colombia with our two daughters. Funds are being collected in British pounds sterling, through GoFundMe, and will be withdrawn here in Colombia using a bank account and card with zero foreign transaction fees - to maximise the amount received. This money will be transferred to the project director in Bucaramanga, documented and spent according to the accounting standards of the Colombian Methodist Church. The money raised on this site will be used to purchase food and other essential materials for pregnant Venezuelan women and mothers of babies. It will also fund the production of information leaflets regarding migrants' rights and the availability of other essential services.